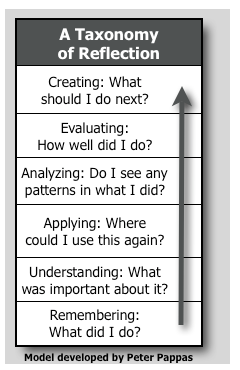 Does this taxonomy of reflection highlight the difference between descriptive learning and critical learning? Firstly, let’s look at the taxonomy itself and why it has been created. Often in education we don’t allow for our students to reflect on their own learning. “It’s not something that’s fostered in school – typically someone else tells you how you’re doing!” (Pappas, 2010). Reflection allows the opportunity for students to be actively involved in their own learning processes, and to recognise and acknowledge abstract patterns, connections and progress of their learning (Pappas, 2010). So, how does this model apply to descriptive learning and/or critical learning theories, if at all? “Descriptive learning theories make statements about how learning occurs and devise models that can be used to explain and predict learning results.” (Ulrich, 2008, p.37). Critical learning theory “looks at the ways in which political ideology shapes Education as a way of maintaining existing regimes of priviledge and social control.” (Ward, n.d.). So, with that in mind, does this taxonomy illuminate the difference between the two learning theories? In my view, it comes down to the guidance and flexibility within the classroom learning community. The process of reflection could certainly be applied in a descriptive learning theory by using it purely to reflect on the learning process of individuals in order to better improve learning outcomes in future. By allowing students to personally consider and reflect on their learning experiences and the outcomes of those, they can then translate and apply that understanding and knowledge to future learning opportunities, hopefully leading to a deeper understanding of the content being learnt (i.e. future outcomes). creating (what can I do next?). These could start discussion and reflection around theories such as the “null curriculum” (Einser, 2002, pp. 87-107) – what schools do not teach, along with consideration of both the explicit (academic goals and outcomes) and implicit (culture and values replicated in the classroom and school) (Eisner, 2002, pp. 87-107). By allowing students to follow the guidelines of the taxonomy for a deeper reflection of their learning experiences (processes and content), then perhaps students (and teachers) will begin to identify the differences between the two learning theories and see which holds more relevance to our educational experiences. Food for thought. References – Eisner, E. W. (2002). The educational imagination: On the design and evaluation of school programs (pp.87-107). New York, NY : Macmillan. Ullrich, C. (2008). Descriptive and prescriptive learning theories. Pedagogically founded courseware generation for web-based learning (pp. 37-42). Berlin: Springer.